The head is broad between the ears with a slightly domed skull. Total length of head from occiput to end of nose is 9 to 10 inches in males and 8 to 9 inches in females. Stop is prominent. Muzzle is long, broad and deep, square in profile with flews that well cover the line of the lower jaw. Depth of foreface should be 3 to 4½ inches. Eyes-rather large, set wide apart in skull. Round in shape and dark brown in color (never lighter than light brown). Eye rims tight and close fitting. No excess third eyelid should be apparent. Expression is a typical pleading hound expression, never wild or cowering. Ears-set low and devoid of erectile power. Should be thin with a slight roll, taper well towards a point, and reach well towards the end of the nose when pulled forward. Well attached to head to prevent hanging or backward tilt. Nose-large with wellopened nostrils. Fully pigmented, black in color. Teeth-scissors bite preferred, even bite acceptable. Undershot or overshot are disqualifying faults. Disqualifications: undershot or overshot. Round (cat-like) with well arched toes and thick, tough pads. Set on slightly below the line of the back, strongly rooted and tapering to a moderate length (in balance to the overall length of the hound). Carried high with a forward half-moon curve. Well coated but without flag. Preferred color is a dark blue, thickly mottled body, spotted by various shaped black spots on back, ears and sides. Preference is to more blue than black on body. Head and ears predominately black. With or without tan markings (over eyes, on cheeks, chest and below tail) and red ticking on feet and lower legs. A fully blue mottled body is preferred over light ticking on the body. There should be more blue ticking than white in the body coat. No other colors allowed. Disqualifications Any color other than that described in the standard. Albinism. Active and vigorous, with topline carried firmly and head and tail well up. Active, ambitious and speedy on the trail. 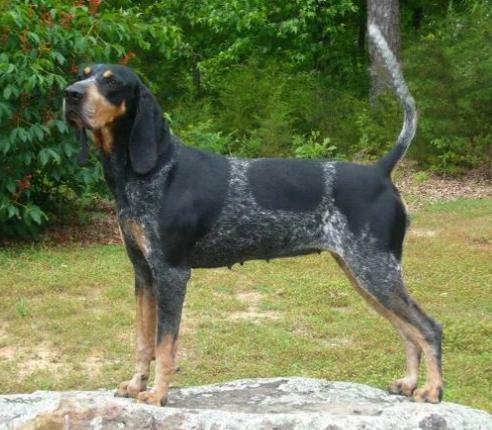 The Bluetick should be a free tonguer on trail, with a medium bawl or bugle voice when striking and trailing, which may change to a steady chop when running and a steady coarse chop at the tree. Males under 22 inches or over 27 inches. Females under 21 inches or over 25 inches. (Entries in puppy class are not to be disqualified for being undersize.) Any color other than that described in the standard. Undershot or overshot. Albinism. Click Here to Learn about breeder background checks on Bluetick Coonhound breeders if you are looking for Bluetick Coonhound puppies for sale. Click Here to learn how ResearchBreeder.com can help you find healthy Bluetick Coonhound puppies for sale. Click Here to order a Breeder or Kennel Background Check on Bluetick Coonhound Breeders that may have Bluetick Coonhound puppies for sale. Click here to find the national breed club for Bluetick Coonhound puppies for sale. Click Here to purchase a list of approved ResearchBreeder.com Bluetick Coonhound Breeders who have Bluetick Coonhound puppies for sale.